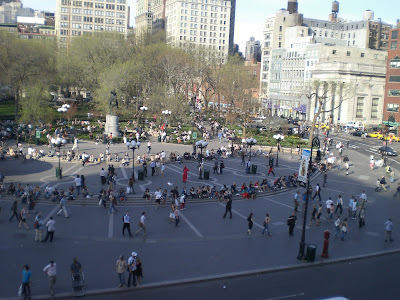 Located near NYU and poised atop a major subway station, Union Square is the heart of NYC public political activism, hosting rallies on every major cause: anti-war, gay rights, immigration reform, etc. After 9/11, Union Square was the focal point for public expressions of grief, as it was the closest gathering point to Ground Zero of any size. Embiggen to cruise.